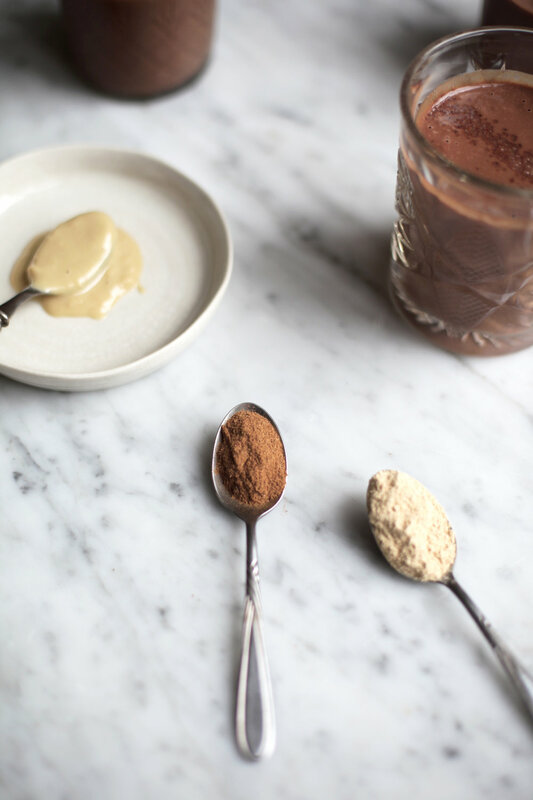 We're in the midst of hot drink season and for those who tend to avoid coffee, don't like tea or just want something a little different or more indulgent, we've given the hot chocolate a nutritional makeover. Unlike most healthy (for want of a better word) hot chocolate recipes, this one involves quinoa, which not only elevates the protein, fibre, amino acids and omega 3 content of the drink, but also increases the creaminess of it like nothing else. Many vegan / dairy free hot cacao drinks are either weak and watery, or when made with soaked cashews or perhaps oats, tend to be a little too rich. This recipe is still thick and creamy but is less heavy and also lower in fats and calories if that's something that concerns you. We’d recommend this drink first thing in the morning instead of a smoothie (it is basically a hot smoothie) or mid afternoon if you're hungry between lunch and dinner. This drink is a functional addition to particularly active lifestyles and also, rich in antioxidants, has the power to support immunity and protect the body at times of fatigue and weakness and from threats of illness. 1. Place all of the ingredients in a high speed blender with all the other ingredients. 2. Blend on a medium speed for 30 seconds then on the highest speed for 1 minute, until the mixture is completely smooth. 3. Taste and season, adding more superfoods, salt or dates to suit your tastes then transfer to a saucepan and heat, whisking, over a low - medium heat. 4. If the result is too thick, add a little extra nut milk or water to thin to your tastes. 5. Serve piping hot. Top with himalayan pink salt, Qnola of choice or any superfoods / spices you used in the recipe, or decorate and infuse with fresh rosemary, dried rose petals or chamomile flowers.